The religious beliefs and practices of Americans differ greatly across religious typology groups. At one end of the spectrum are the Sunday Stalwarts. Overwhelming majorities of these devout and religiously traditional Americans say they attend church regularly, pray on a daily basis and place high importance on religion in their lives. God-and-Country Believers and the Diversely Devout also are highly religious by many measures. At least nine-in-ten people in these groups say religion is “very” or “somewhat” important in their lives, and roughly six-in-ten or more also say they pray every day. But compared with Sunday Stalwarts, far fewer God-and-Country Believers and Diversely Devout are regular churchgoers: Just 27% of God-and-Country Believers and only 12% of the Diversely Devout say they attend religious services at least once per week. At the other end of the religious spectrum are Religion Resisters and the Solidly Secular. Both groups almost entirely refrain from attending religious services and participating in personal prayer, and overwhelming majorities say they do not consider themselves religious and that religion is not important in their lives. The Relaxed Religious and the Spiritually Awake tend to fall between the three highly religious groups and the two nonreligious groups on these measures. For instance, about two-thirds of the Relaxed Religious and six-in-ten of the Spiritually Awake say religion is at least somewhat important in their lives. But Americans in these groups tend not to participate in religious practices with much frequency. In many ways, the public’s beliefs about God also follow predictable patterns. Overwhelming majorities in the three highly religious typology groups say they believe in God as described in the Bible. Fewer in the somewhat religious groups believe in the biblical God, though nearly everyone in these groups believes in a higher power of some kind. And nonbelievers – those who say they do not believe in any higher power at all – are concentrated among the Solidly Secular. The survey also finds clear and consistent differences in views about the nature of God between the highly and somewhat religious groups, on one hand, and the nonreligious groups on the other. Simply put, those in the highly religious and somewhat religious typology groups express much higher levels of belief in an active, powerful deity who is involved in the daily lives of humans. Questions about New Age beliefs, by contrast, elicit a different pattern of responses. Here, people in one highly religious group (the Diversely Devout), one somewhat religious group (the Spiritually Awake), and one nonreligious group (Religion Resisters) express high levels of belief in the presence of spiritual energy in physical objects like mountains, trees and crystals, as well as belief in psychics, reincarnation and astrology. These beliefs are much less common among the other typology groups. One-quarter of Americans (24%) say they are spiritual but not religious. 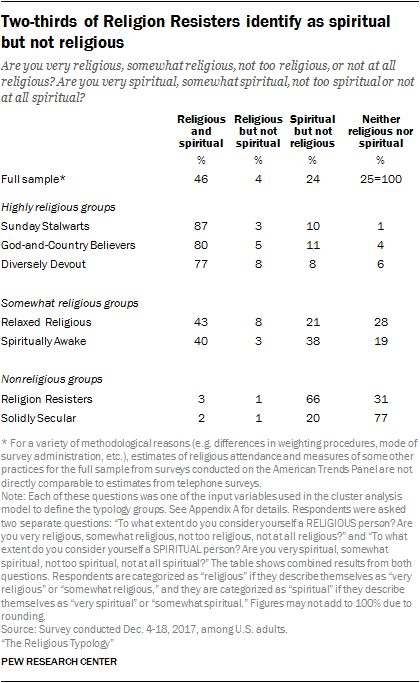 This includes about two-thirds of Religion Resisters, a much larger share than among any other typology group. An additional one-quarter of U.S. adults, including 77% of the Solidly Secular, describe themselves as neither spiritual nor religious. Very few Americans, just 4% overall, describe themselves as religious but not spiritual. The three highly religious typology groups all place considerable importance on religion. For example, nearly all Sunday Stalwarts say religion is “very” (88%) or “somewhat” important (10%) in their lives. God-and-Country Believers also overwhelmingly say religion is at least somewhat important to them (95%), including 67% who say religion is very important in their lives. And while the Diversely Devout are somewhat less likely to say religion is very important to them (51%), fully nine-in-ten (90%) say religion is at least somewhat important in their lives. While the Relaxed Religious and Spiritually Awake do not place as much importance on religion as do the three highly religious typology groups, religion is at least somewhat important to most members of these groups. 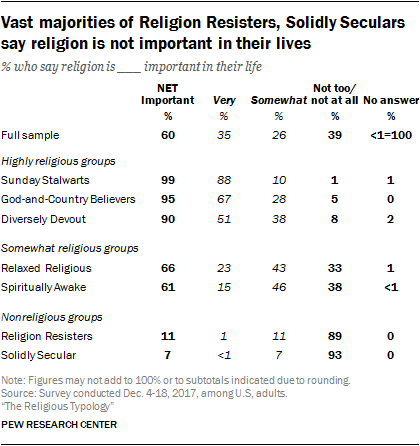 By contrast, the vast majority of Religion Resisters (89%) and the Solidly Secular (93%) express that religion is “not too” or “not at all” important in their lives. Those who said religion is “very important” to them (35% of all respondents) received a follow-up question that asked which of two statements best describes them – “My religion is the single most important thing in my life,” or “Although my religious beliefs are important, there are other things in my life that are equally important or more important.” In response, nearly half of those who received the question (16% of all respondents) say religion is the most important thing in their lives, while a slightly higher share (19% of U.S. adults) say religion is very important to them, but not necessarily the most important thing in life. About half of all Sunday Stalwarts regard religion as the single most important thing in their lives. God-and-Country Believers are more divided: About three-in-ten say religion is the most important thing, while roughly a third say other things are equally or more important, and the remaining third do not consider religion to be very important to them. Members of the Diversely Devout are less likely to say religion is the most important thing (18%) than they are to say that other things in life hold equal or higher importance compared with religion (33%), while about half do not regard religion as a very important part of their lives. Nearly nine-in-ten Religion Resisters and Solidly Seculars say they seldom or never attend religious services. The Relaxed Religious and Spiritually Awake are much more varied in their attendance habits. 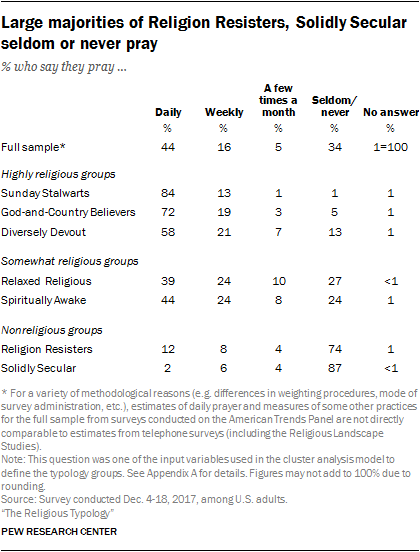 Relatively few Americans in these two groups say they attend religious services on a weekly basis. But about one-third in each group say they attend religious services once or twice a month or a few times a year. About half of the Relaxed Religious and 56% of the Spiritually Awake say they seldom or never attend religious services. When it comes to more private religious practice, Sunday Stalwarts again stand out as the most devout. More than eight-in-ten Sunday Stalwarts (84%) say they pray every day. Seven-in-ten God-and-Country Believers (72%) also pray on a daily basis, as do about six-in-ten of the Diversely Devout (58%). Most members of the Relaxed Religious and Spiritually Awake say they pray at least once a week, although people in these categories are less likely than those in the three highly religious typology groups to say they pray on a daily basis. Meanwhile, large majorities of the Solidly Secular (87%) and Religion Resisters (74%) say they seldom or never pray. 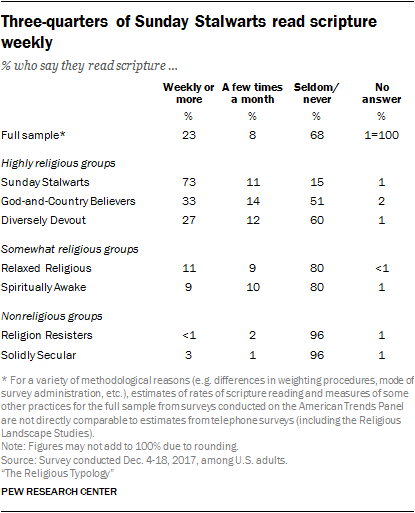 Sunday Stalwarts are the only typology group in which most people (73%) say they read scripture at least once a week. This is a much higher share than the other two highly religious groups: Just one-third of God-and-Country Believers and about a quarter of the Diversely Devout (27%) say they read scripture on a weekly basis. Even smaller shares of Relaxed Religious (11%), Spiritually Awake (9%) and Solidly Secular Americans (3%) read scripture on a weekly basis. And virtually no Religion Resisters say they read scripture weekly. Sunday Stalwarts also consume religious media more than any other religious typology group, with four-in-ten saying they watch or listen to religious programming at least once a week. 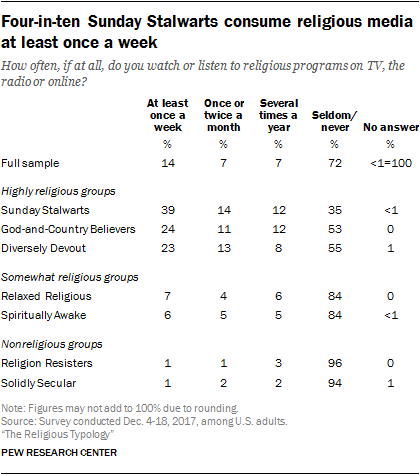 About a quarter of God-and-Country Believers and the Diversely Devout also watch or listen to religious media at least once a week. By comparison, much smaller shares of all other groups say they regularly consume religious media. Like the three highly religious groups, those in the somewhat religious typology groups also overwhelmingly believe in a deity. They are less united, however, in expressing belief in God as described in the Bible. 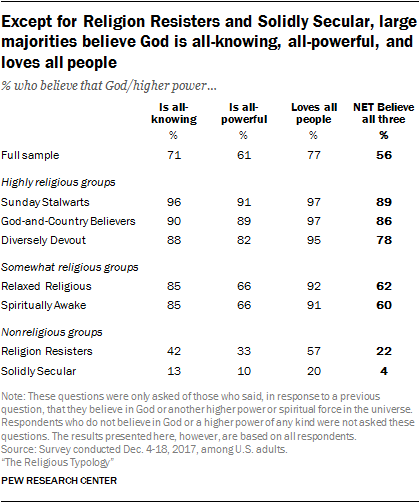 Many of those in the Relaxed Religious category (28%) and an even larger share of the Spiritually Awake (49%) say they do not believe in God as described in the Bible, but do believe in a higher power of some kind. Very few Americans in the two nonreligious typology groups say they believe in God as described in the Bible (3% among Religion Resisters, 1% among the Solidly Secular). But these two groups sharply diverge when it comes to belief in some other higher power or spiritual force. 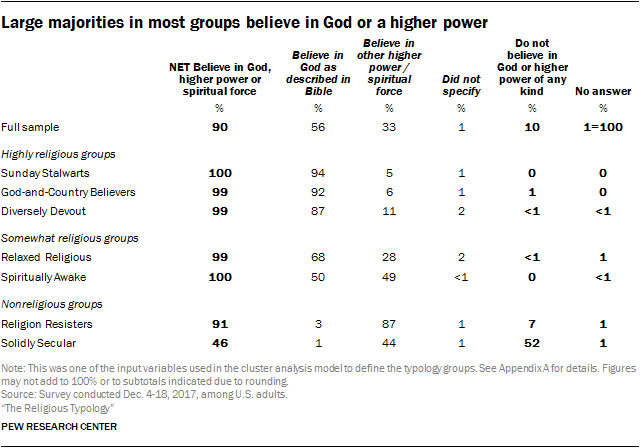 Roughly nine-in-ten Religion Resisters (87%) say they believe in a non-biblical God or higher power, while about half of the Solidly Secular (52%) do not believe in any higher power or spiritual force. There are similar patterns across the typology categories on questions about the Bible. Roughly nine-in-ten or more of the Diversely Devout, God-and-Country Believers and Sunday Stalwarts say their holy scripture is the word of God.8 Somewhat smaller majorities of the Relaxed Religious (82%) and the Spiritually Awake (73%) share this belief. By contrast, large majorities of Religion Resisters and the Solidly Secular say holy scripture was written by people and is not the word of God. While they mostly agree that holy scripture is the word of God, the highly religious and somewhat religious groups differ in their views about whether scripture should be interpreted literally. Roughly half of Sunday Stalwarts (54%), God-and-Country Believers (57%) and the Diversely Devout (54%) say the holy scripture should be taken literally, word for word. By contrast, just one-in-ten among the Relaxed Religious and the Spiritually Awake share this perspective, while many more in these groups see holy scripture as something that should not be taken literally. The survey also asked about God’s level of involvement in people’s lives. 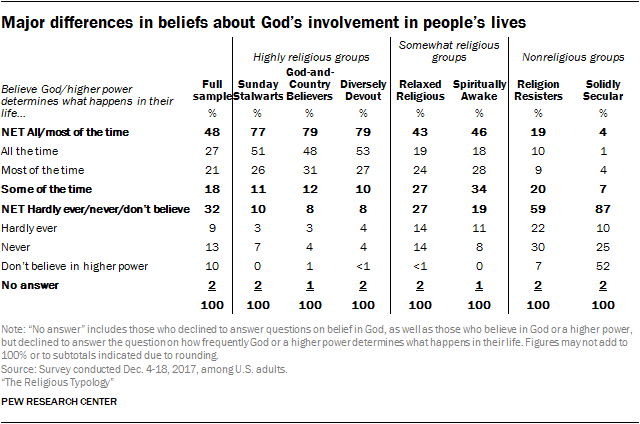 Large majorities of those in the highly religious typology groups (77% of Sunday Stalwarts, 79% of God-and-Country Believers and 79% of the Diversely Devout) say that God or the higher power in the universe determines what happens in their lives all or most of the time. Those in the Relaxed Religious and Spiritually Awake categories are less convinced that God dictates what happens to them most or all of the time, though majorities in these two groups agree that God determines what happens to them at least some of the time. Finally, among Religion Resisters and the Solidly Secular, most people believe God or another higher power in the universe rarely or never intervenes in their lives (or they don’t believe in God at all). About eight-in-ten or more in the highly religious and somewhat religious groups say they talk to God, compared with 54% of Religion Resisters and 17% of the Solidly Secular. But there are substantial gaps between the highly religious and somewhat religious typology categories on the question of whether God talks back to them. 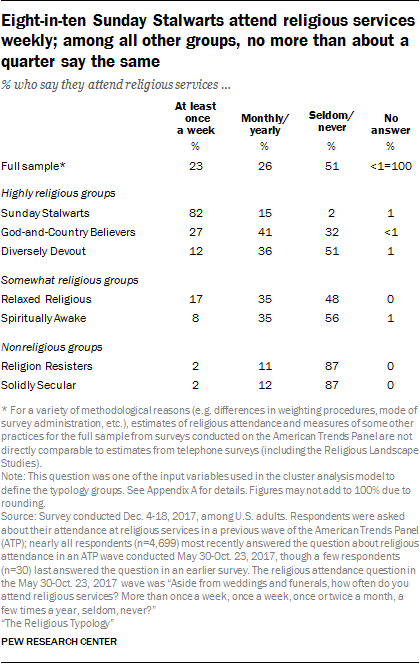 At least four-in-ten Sunday Stalwarts (54%), God-and-Country Believers (40%) and Diversely Devout Americans (44%) say God talks to them, compared with roughly half as many among the Relaxed Religious (21%) and Spiritually Awake (24%) and even smaller shares among the nonreligious groups – including just 2% of the Solidly Secular who say God talks to them. The question of whether a person needs to believe in God to be moral and have good values was among those used to help create the typology groups – and provided clear distinctions across most of the groups. Nearly all of those who were sorted into the Diversely Devout (99%) say belief in God is necessary for morality, and 93% of God-and-Country Believers share this view. A slimmer majority of Sunday Stalwarts (62%) say a person needs to believe in God in order to be moral and have good values. By contrast, nearly all of those who were sorted into the somewhat religious or nonreligious groups are united in the opposite view, saying it is not necessary for a person to believe in God to be moral and have good values. On questions about the nature of God, there is a different dividing line among the seven typology groups: The three highly religious and two somewhat religious groups generally are united in expressing belief in an active, engaged God, while the two nonreligious groups do not see God or another higher power as a particularly active or powerful player in the world (if they believe in God at all). Among all five of the highly religious and somewhat religious groups, about eight-in-ten or more say they believe God or another higher power in the universe is all-knowing. Roughly two-thirds or more in all five of these groups say God is all-powerful. And overwhelming majorities in these five groups say God loves all people. Six-in-ten or more people in each of these groups say they believe God possesses all three of these attributes (omniscience, omnipotence and a love for all people). Similarly, large majorities among Sunday Stalwarts, God-and-Country Believers, the Diversely Devout, the Relaxed Religious and the Spiritually Awake say they have been protected or rewarded by God or another higher power. 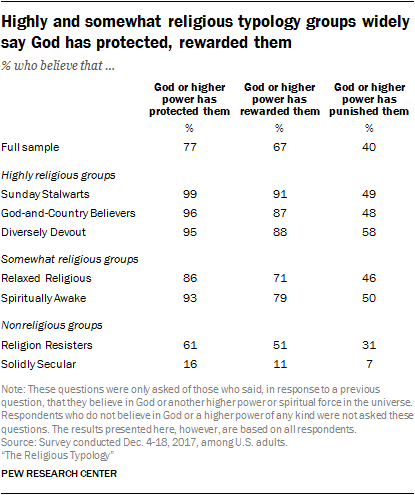 By comparison, smaller shares of Religion Resisters express these beliefs, and relatively few Solidly Secular Americans say they have ever been the beneficiary of God’s protection or rewards. Fewer people say they have been punished by God than say they have been rewarded or protected by a deity. But here again, those in the highly religious and somewhat religious groups are more likely to say they have incurred God’s punishment than are Religion Resisters or the Solidly Secular. 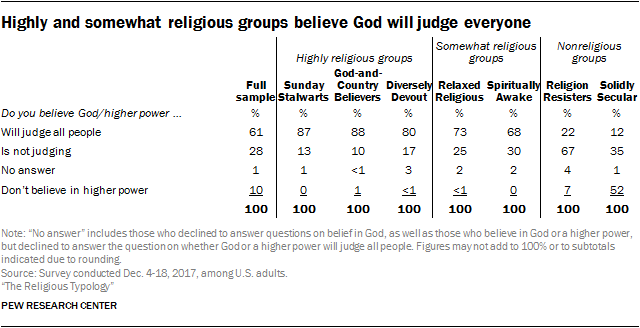 Eight-in-ten or more among Sunday Stalwarts (87%), God-and-Country Believers (88%) and the Diversely Devout (80%) believe God or a higher power will ultimately judge all people on what they have done. And majorities of the Relaxed Religious (73%) and the Spiritually Awake (68%) say the same. At the other end of the spectrum, only about one-in-five Religion Resisters (22%) say they believe God or another higher power will judge all people. And among the Solidly Secular, just 12% share this view. In their beliefs about the afterlife as well, more unites rather than divides the three highly religious and the two somewhat religious typology groups. There is near-unanimous belief in heaven among Sunday Stalwarts (97%), God-and-Country Believers (96%), the Diversely Devout (94%), the Relaxed Religious (95%), and the Spiritually Awake (98%). The survey finds lower levels of belief in hell than in heaven, but large majorities of all five of these groups also say they believe in hell. By contrast, far fewer Religion Resisters and Solidly Seculars say they believe in heaven (12% and 4%, respectively) or hell (5% and 2%). While the five highly religious and somewhat religious groups are more similar than different in their beliefs about the nature of God and the afterlife, the survey finds a very different pattern in response to questions about supernatural New Age beliefs that are not traditionally associated with Christianity. Three of the typology groups – one from the highly religious category (the Diversely Devout), one from the somewhat religious category (the Spiritually Awake), and one from the nonreligious category (Religion Resisters) – stand out with particularly high levels of these alternative beliefs. Indeed, 95% of the Diversely Devout say they believe spiritual energy is located in physical objects, such as mountains, trees and crystals. God-and-Country Believers are similar to the Diversely Devout in some other ways, but no one in this category shares this belief about spiritual energy. There are similar contrasts on this question – which was used to help create the typology groups – between the two somewhat religious groups. Virtually all of the Spiritually Awake (99%) believe spiritual energy can be found in physical objects, compared with none of the Relaxed Religious (0%). Likewise, among the nonreligious, 98% of Religion Resisters believe spiritual energy is located in the physical world, while few of the Solidly Secular share this belief (<1%). 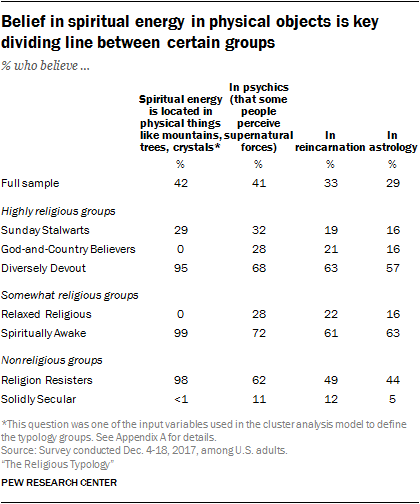 The divergences are not quite as stark when it comes to belief in psychics, reincarnation and astrology, which were not included in the cluster model. But still, on all three of these questions, the Diversely Devout, the Spiritually Awake and the Religion Resisters stand out for their relatively high levels of belief in these supernatural phenomena.